← "Millionaire’s" revamp – Jump the question or the shark? Planet Express is now making weekend deliveries. In a deal that seemingly came together overnight, Twentieth Television has secured clearances to run Futurama on WCIU in Chicago and several Tribune-owned stations as an one-hour, all-barter block on weekends in the fall of 2011. While WCIU has acquired Futurama in Chicago to air, Tribune stations signing on include WPIX in New York, KTLA in Los Angeles and KDAF in Dallas. (Tribune flagship WGN passed due to other weekend programming and sports commitments.) Tribune also cleared the show on its Indianapolis, Hartford, New Orleans, and Seattle duopolies. The series (created by The Simpsons‘ Matt Greoning), returned to Comedy Central this year in first-run episodes after a seven-year hiatus (it ran on Fox for 72 episodes between 1999 and 2003.) Reruns of the program ran on Adult Swim until December 2007. The show’s voice cast includes Billy West, Katey Sagal, John DiMaggio, Lauren Tom, and Maurice LaMarche. This fall, Twentieth is syndicating American Dad reruns to air in an one-hour block and expand to a strip in September 2011. 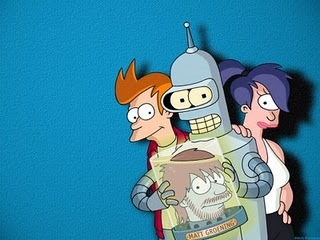 It is not known if Twentieth has the same plans in store for Futurama come fall 2012. Futurama’s return on Comedy Central on June 24 drew nearly three million viewers, the highest season-premiere rating for any animated series on cable outside of South Park.